What’s in a name? as the Very Reverend Roland Fartfinger was once said to infamously remark. 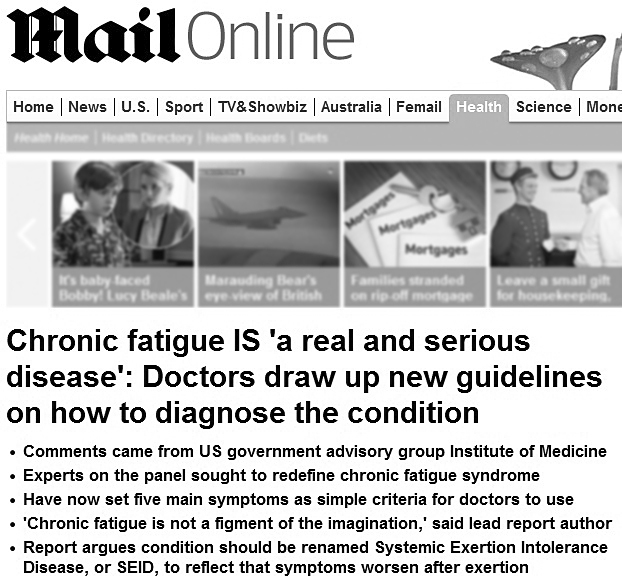 Well, if it’s Myalgic Encephalomyelitis [ME] or Chronic Fatigue Syndrome [CFS] or Chronic Fatigue Immune Dysfunction Syndrome [CFIDS], or at its absolute media derisory worst, Yuppie Flu, apparently quite a lot, as last week witnessed it undergoing yet another suggested name-changing metamorphosis: Systemic-Exertion-Intolerance Disease [SEID]. Twenty-five years ago my life was turned upside-down. In short, I flew to Canada, found myself unexpectedly hospitalised by what was said to be a particularly nasty virus and later flown home. I had no idea what had begun. Five weeks after returning home, and still mysteriously struggling with what was now labeled post viral fatigue, I wrote in my journal: “If someone had told me I would still feel like this after five weeks, I wouldn’t have believed it…” Twenty five years later and I’ve never fully recovered. Around twenty-three years ago I was finally diagnosed by Dr Stuart Glover [a physician who had been working with HIV/AIDS patients who became curious by this growing subgroup of people, presenting with similar symptoms, but exhibiting no definitive biomarkers in blood tests, etc.] as having ME/CFS. And that conjoined name is an important distinction; essentially refusing to allow the neurological component to be fatefully ignored. All the headlines I’ve seen are effectively taking a similar tone. Apparently, the disease that’s torn through my life for 25 years is real; essentially confirming the only thing that’s genuinely evolved in the 25 years of my own journey … a quietly repetitive stasis. The World Health Organisation listed the disease as a neurological condition in 1969. Meanwhile, our own government [UK] has continued to drag its arse, to the extent where it wasn’t fully acknowledged until the turn of the new millennium – in terms of easier access to disability benefits, where appropriate – and was still arguing its relative merits as a genuine neurological condition as recently as 2010. But here we are in 2015 still producing headlines regarding its reality; while the absolute reality of the condition is that it largely lumbers on in thinly researched and poorly funded darkness. The Washington Post article contains the paragraph: ‘Christine Williams, who has the illness herself and is vice-chair of the board of directors for the advocacy group Solve ME/CFS Initiative, welcomed the IOM report. “I have been sick for six-and-a-half-years, and this is definitely the most encouraging thing that I have seen.” I find it quite depressing to read that. And I wonder how she might feel if she were to exchange 6½ for 25? When I was first diagnosed, to say ME/CFS was a vast grey area would be to undermine an easy adjective to describe a group-selfie of all the elephants that ever walked the earth! So, I began to educate myself as best I could, and became active in my own way by in turn educating the local hospital [FACTS Information Service] and then into the foothills of the brave new world [instigating and supporting UK-based online CFS newsgroups/forums] and raising awareness. It was an important learning period, but after probably about 6½ years … I stepped away; with it all becoming a little repetitive and exhausting, as well as feeling increasingly like it had begun to define me. I chose to look forward and gain a new focus: rediscovering my passion for photography and teaching [part-time] at high school. Reading all this now … it’s as astonishing as it is depressing; to feel that in the interim decade and more, very little has really changed. And the significant new development is another suggested name change! Okay, in terms of lazy stigma, it’s welcome; particularly for those severely affected. One mother commented in another article on her own daughter – who sadly committed suicide after 25 years and was predominantly severely affected during the entire time “… calling the disease that ravaged my daughter’s life Chronic Fatigue Syndrome is a little like calling stomach cancer Chronic Upset Tummy.” And, while still lacking those definitive biomarkers, a focused diagnostic criteria is equally welcome – albeit I could’ve predominantly written what’s seemingly now accepted word-for-word … some 20+ years ago! And maybe, instead of wasting all the intervening time worrying about perceived realness, some truly in-depth worthy research were conducted instead. Personally, I don’t dwell on all this too often these days; it simply began to consume too much of the energy reserves I did possess. So, I now choose to focus on what I can achieve – and can still achieve – rather than the spectre. But, even now, when I do bump up against news like this, I do find it quietly astonishing when I contemplate the numbers … 25 years. Approaching half my life! And, as near as damn it, I’ve spent nearly all that time educating myself as best I can; and managing the condition myself. No real treatment; outside the wonderful, and vitally important, work done by The Optimum Health Clinic; almost in complete isolation from the ‘health service’. I’ve largely educated my own doctor over the years. When I look at these apparently ‘enlightened’ headlines today, some 25 years down the line, it rings a bit hollow. Albeit I’m more than happy to know that such announcements should at least help new sufferers avoid the indignity of stigma and plain, vague ignorance. And, hopefully, we will soon see further medical progress. ME/CFS has never exactly been helped by remaining poorly understood/researched, and additionally by the majority of sufferers making at least degrees of recovery [usually over a number of years but rarely returning to previous levels of health]; and often ascribing recovery to a prevailing ‘treatment’. So, it’s especially encouraging to see the report from Stanford University [October 2014] produce some genuinely potentially exciting research results, where radiologists discovered that the brains of patients with ME/CFS have diminished white matter and white matter abnormalities in the right hemisphere. I’ve long been convinced, like Dr Stuart Glover, that one day the answer would likely be found to be all in the mind – although not that necessarily espoused by the occasionally ugly, gong banging psychiatric doctors, like Professor Sir Simon “[I] could have been more diplomatic” Wessely … but in the brain. So sad that you have suffered with this problem for so long. At least this is a step in the right direction towards acknowledging that it is exists! That’s very kind, Suzanne. I’m not sure the admiration sits too comfortably with me; I think it’s simply been a case of adapting to the shifting sands of health when, essentially, you’re not really left with too many options. But thank you. So sorry to hear you have been suffering of this disease. I have met in IG another person with the same problem. of course is a disease, a physical disease, not a psychological disoder. I have been suffering for about 15 years of a very painful sindrome . Treated with psychotherapy. Until was found the serious disease behind. Hi Valeria. I think I must’ve missed this Reply in here … apologies, albeit I know we’ve since discussed this elsewhere. Amazing to think another year has rolled around since this was first written. The very definition of inertia creeps, eh? !